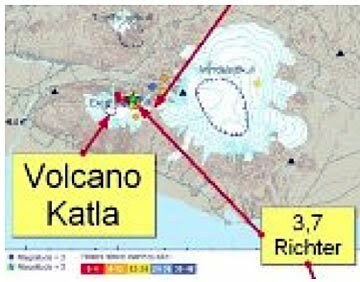 Update Since I wrote this post I have discovered that Icenews had the location of the Katla volcano wrong in the figure below. I have corrected the location in a separate post. My apologies. There have been a couple of earthquakes that have exceeded magnitude 7 over the last few days. First there was the 7.2 magnitude earthquake near Mexicali on Sunday, which destroyed more than 5,000 homes. Then there was the 7.7 magnitude earthquake that struck Northern Sumatra at 5:15 pm (CST) today. The latter was smaller and will apparently not produce a tsunami of the type that killed over 230,000 people in 2004, in Sumatra. Nevertheless the impact is likely to have been severe. And yet I keep checking with the erupting Eyjafjallajokull volcano in Iceland, that began spewing lava on March 21st. Remembering that it has usually presaged a much more violent eruption from the nearby Katla volcano, which being under the Mýrdalsjökull glacier, will likely generate results that are expected to be much more severe. Vulcanologists have been expecting an eruption from the volcano for some time. It forms part of the set with Laki and Eldgia which are considered to be some of the most powerful volcanoes in the world. Thus when I read that there has just been a 3.7 magnitude earthquake in the Katla region, moving away from the initial eruption and between Katla and Laki, my concerns just grew a little. There are already reports of toxic gas emissions from this smaller eruption, which could warn of much greater problems if much higher volumes of gases such as sulfur dioxide are ejected with a subsequent eruption from the volcanoes to the North-East of the current eruption. Location of the earthquake relative to Katla, Eyjafjallajokull is further west.